Winter, spring, summer and fall—it’s crucial to keep your home comfortable through them all. When you choose a heat pump from Swanton Energy Services, you can meet all of your comfort demands in one fell swoop. That’s because a heat pump is a multipurpose, affordable and powerful comfort system that transfers heat rather than generates energy. This unique characteristic gives it the power and versatility to deliver both chilled relief and warm contentment. So, whether it’s sweltering hot or freezing cold outside, you can count on your heat pump to keep your nest just how you like it—cozy. As you know, many birds migrate south in the winter and north in the summer. Well, a heat pump operates in a similar manner. You see, in the winter, a heat pump extracts heat from the outside air and transfers it inside. This fires up your home’s coziness. Conversely, in the summer, a heat pump pushes warm air out of your home, leaving behind the chilled relief that you crave. When you choose a heat pump, you land a system that has the versatility to both heat and cool your home, eliminating the hassle of maintaining two separate comfort systems. A heat pump isn’t just versatile. It’s also energy efficient and one of the most affordable systems on the market. Adding a heat pump to your home opens the door for a whole new level of contentment—but that’s only if your system is installed correctly. Well, our team at Swanton is committed to ensuring your flight toward total comfort is a smooth one. Because of this, we’ll use our wingspan of expertise to install your heat pump flawlessly the first time. Plus, from swift heat pump repairs to thorough system inspections, you can count on us to swoop in with all of the post-installation services your heat pump needs, too. At Swanton, we only want the best for your nest—and that’s a heat pump. So, to make the switch to the affordable and efficient comfort system, fill out our online form or call us at 732-335-6731 today! Don’t let the similarities in appearance and cooling capabilities fool you. Heat pumps are the smart alternative to an air conditioner. Not only do heat pumps deliver the chilled relief you crave, but also, when the cooler months arrive, these units reverse their operation to keep your home warm and cozy. Plus, heat pumps dehumidify your home, too! Simply put, heat pumps do it all. Are you searching for a smarter way to heat, cool and dehumidify your home? If so, then look no further than an Infinity®Series heat pump from Carrier. These units combine precise heating and cooling, unwavering comfort, uncompromising energy efficiency and ultra-quiet cooling performance to deliver the ultimate comfort experience—and unbeatable savings. It’s truly a difference you can feel. A Performance™ Series heat pump from Carrier delivers on more than just its name. This model bears versatility, flexibility and top-of-the-line efficiency, too! It’s what we like to call a win-win situation for both your comfort and your budget. If you find total comfort to be the ultimate luxury, then indulge yourself in a Comfort™ Series heat pump from Carrier. These versatile units offer summer dehumidification, air conditioning and cold-weather heating performance. 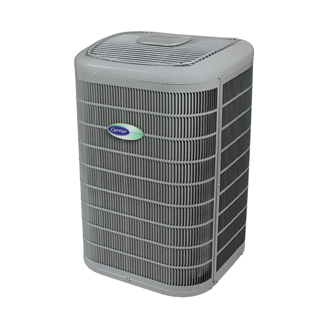 To top it off, these models are the most economical way to attain a more efficient heat pump.